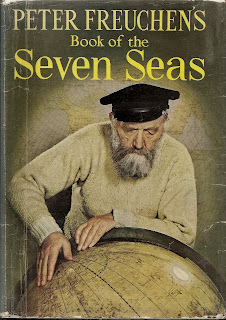 Not since the publication of the "American Practical Navigator" in 1802, by Nathaniel Bowditch, has there been a book written about the sea that is so all encompasing, as is the case in this 1958 publication by Peter Freuchen. That's him on the cover, looking exactly as one would expect from his writing. This is a work of non-fiction which explores the beginnings of earth, and the "Big Bang" theory, as a way of explaining how the ocean basins were physically formed when the sun cast off a ball of flaming gases, which became the earth. The basins were formed by the violence attendant in the cooling process of the molten sphere that would become our home. During this process, a chunk of the sphere broke off, becoming our "moon." This moon would come to control our tides. The pits, valleys and craters left on the earth by this process were then filled by an enormous rain, one which lasted for about 40 centuries and produced 300,000,000 cubic miles of rain. This book is organized into 11 parts, among them The Shape of the Sea, Life in the Sea, Great Voyages, Treasures of the Seven Seas, Law and the Seven Seas, and even a section on Strange Tales from the Seven Seas. In short, this book has something of interest for anyone who has an interest in the oceans, and the legends and history that go with them. This book is also a political and military history. It follows the Voyages of Discovery and delves into the settlements of the "new worlds" beyond the horizons of Europe. Along with the tales of pirates and ghost ships, this book packs in quite a bit of science and information about how the oceans current's are formed, as well as the effects of the weather upon the motion of the oceans. This is an example of one of those rare books that can be found "in the stacks" at the Mooresville Public Library. My usual modus upon entering the library, after greeting the librarians, is to head towards the shelf of newly released books. This is my effort to maintain "relevancy." If there is nothing there to catch my eye, I wander into "the stacks", that great expanse of books from decades gone by. My tastes run, for the most part, between the 600's and the high 900's in the old Dewey Decimal System. That's the joy of the library, you go in with a vague notion of what you might want, and leave with some things you never even thought of. 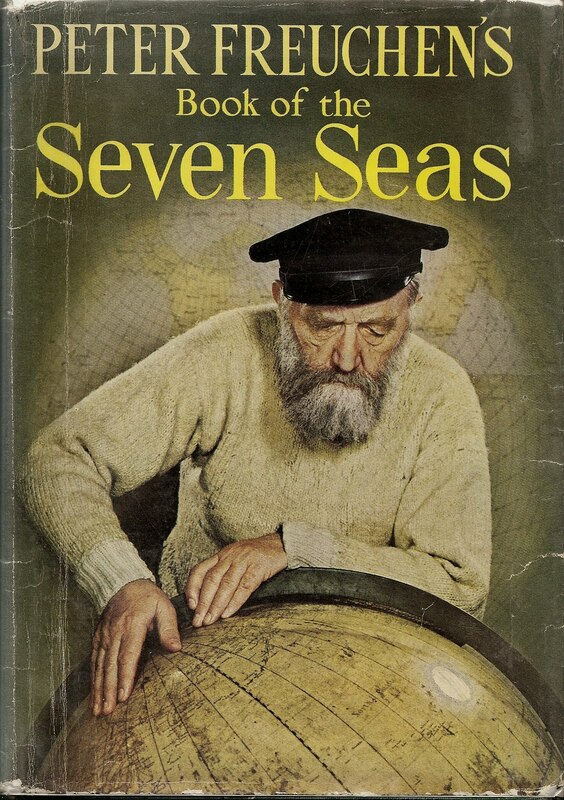 This is a large and scientific book written by a man who spent 6 decades at sea. So, I will have to visit it more than once. The good thing is that I will know exactly where to find it when I need it again. On the shelf at my Piblic Library. Think about that as you watch the politicians turn off the lights in libraries all across America, even while awarding themselves bonuses, and planning new projects that we just can't afford right now. And then, think of Peter Freuchen and the knowledge contained in this book. Locked away in an underfunded library it would be of no value to anyone, and much of what it is written, on all topics, will become forgotten footnotes to history.